Given the recent changes in WisCon leadership, the Tiptree Award motherboard has been asked if our relationship to WisCon will change. The relationship between the two organizations, whose passions and intentions are so strongly aligned, remains vibrant. The Tiptree Award owes so much about its existence and success to WisCon that people sometimes get confused about where the award leaves off and WisCon begins. So let’s clarify. The Tiptree Award was originally announced at WisCon in 1991, at founding mother Pat Murphy’s guest of honor speech (Pat cooked up the idea with Karen Joy Fowler). Pat was instantly surrounded by WisCon attendees who wanted to help, and who spent most of the next year fund-raising and generating ideas. The award is named for James Tiptree, Jr., a pseudonym and persona of Alice Sheldon for many years, and it recognizes works of speculative fiction which explore and expand gender roles. In 1992, the first winners (Eleanor Arnason’s A Woman of the Iron People and Gwyneth Jones’s The White Queen) were announced at WisCon. The award ceremony included a marvelous skit in which WisCon founder Diane Martin, in the role of Alice Sheldon, put on a mustache and an overcoat and slyly provided Sheldon’s work to publishers without revealing Sheldon’s gender. 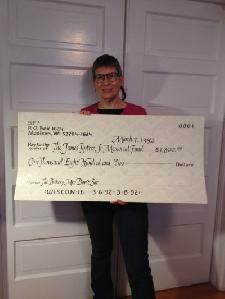 SF3 (WisCon’s parent organization) presented a generous $1800 in award seed money, in the form of a three-foot long check. Over the ensuing years, the Tiptree Award became more formal, and stopped being run out of Pat’s private checking account. As a registered 501(c)(3) corporation with its own “motherboard,” the Tiptree Award does not have any official relationship to WisCon or SF3, although over the years many people have worked on, volunteered for, and been in the leadership of both organizations, either at the same time or sequentially. The motherboard has arranged in the past and may arrange in the future to host award ceremonies at conventions other than WisCon; however, WisCon is uniquely situated in the center of the country, at a perfect time of year, and with a very supportive audience, so we anticipate coming back frequently even if not annually. The Tiptree Award auction has been a feature of WisCon’s Saturday night entertainment for many years, although the first auction was not at a WisCon, but at a Readercon. Ellen Klages, our hilariously engaging auctioneer, has been a WisCon guest of honor, and is a Tiptree Award motherboard member. Some of the proceeds of the auction flow through WisCon’s treasury to the Tiptree Award, while others go directly into Tiptree accounts. All proceeds are used for travel and monetary awards for the winners, plus other Tiptree Award projects. In the past, we have also donated auction proceeds as “seed money” for other WisCon daughter organizations (Broad Universe and The Carl Brandon Society are two examples), and used funds to help members of the Tiptree community who are in need. The volunteers of the WisCon art show graciously supervise and manage Tiptree Award auction items for viewing on Saturday, and handle sale of t-shirts, cookbooks and Space Babe tattoos throughout the weekend; that money also flows through WisCon to the Tiptree Award accounts. We are all looking forward to the 2015 auction. Coincidentally, 2015 is the 100th birthday of Alice Sheldon; the motherboard will work with WisCon’s programming team to include appropriate recognitions and celebrations of this milestone in WisCon programming.